How to choose and wear a white shirt? There is one piece that should never be missing in our wardrobe - classic white shirt. It goes with everything and there are endless ways to style it! Fabric - soft one will look better on our body. Go for chiffon or silk. When you have found your perfect white shirt you should think about how to wear it. 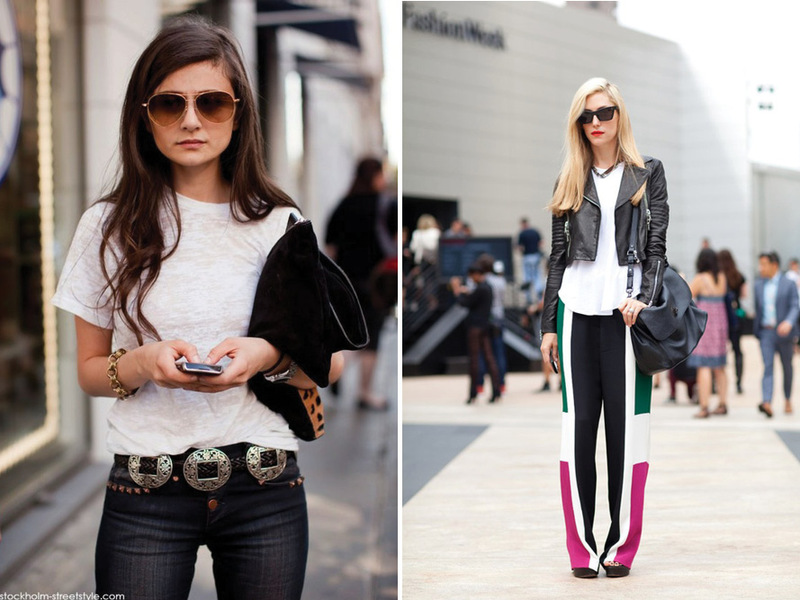 Go for even more relaxed way with leggins. Wear it with palazzo pants or maxi skirt and biker jacket to make a statement. Finally I leave you with my proposal. I wear my white shirt from BaBassu with velvet leggins and wedges. You can also check my other look here. Hay una pieza que nunca debe faltar en nuestro armario - una camisa blanca. Va con todo y hay miles de maneras de combinarla! Tela - mejor que sea suave, de gasa o seda. Cuando ya tenemos la camisa perfecta se la puede combinar de muchas maneras. Aqui os dejo mis 5 favoritas. Ir de una manera más relajado, con leggins. Con pantalones pitillo puede quedar clásico, o si queremos llamar atención podemos ir por un look todo blanco o con pantalón con estampado. Para impresionar podemos combinarla con los pantalones palazzo o una falda maxi y chaqueta biker. Por último os dejo con mi propuesta. Llevo una camisa blanca de BaBassu con leggins de terciopelo y cuñas. Os gusta? Dzisiaj chcialam Wam pokazac pare propozycji na temat bialej bluzki, czesci garderoby, ktorej nigdy nie powinno zabraknąć w naszej szafie. Pasuje do wszystkiego i istnieja nieograniczone mozliwosci jej stylizacji. Materiał - powinien byc miękki, wrecz lejacy sie na ciele. Nalepszy wybor to jedwab lub szyfon. Swietnie wyglada z jeansami, dla odmiany moga byc szorty lub dopasowana spodnica. Naszyjnikiem i butami na obcasie dodamy jej elegancji. Swietna opcja na weekend jest koszula polaczona z legginsami. Niezawodne polaczenie to rurki, zwlaszcza jesli zdecydujesz sie na colosc w bieli lub polaczenie ze spodniami we wzory. Zeby zrobic wrazenie warto ja polaczyc ze spodniami palazzo lub spódnica maxi i kurtka biker. Na koniec zostawiam Was z moją propozycją mam na sobie białą koszulę z BaBassu z aksemintymi legginsami i butami na koturnie. Podoba sie Wam? Really cute outfit! Love that you added different inspirations! Thanks! You look beautiful, Aga. Very charming style by you with this blouse and the lovely bow to go with it. Immensely charming you are! You look great. I love the classic white shirt. Mary-kate looks amazing. I love your outfit and all the examples and tips you give in this post. Thanks! Nice look and great inspiration! Zestaw idealny, uwielbiam czarne kokardy i białe koszule! Świetne stylizacje z tymi koszulami!!!! I like black and white combination! Classy and chic! Love the shoes and your clutch! OH!Very helpful!Thank you for sharing! beautiful outfit , beautiful shirt ! I love the black bow! Beautiful blouse. I like that it's simple, but has a layered and unique back side. Also, you styled it well. Very chic. Thanks also for the style inspiration. I feel that fashion bloggers usually lack concern for their audience. Such is not the case here. Just followed you back cutie <3 1454! Very inspiring post. Your choices are always so stylish and refined. Amazing look and great tips, tnx for sharing!!! Would you want to follow each other via Bloglovin, Twitter & G+ :)? Siento debilidad por las camisas blancas!!! Laa tuya es preciosa y coincido contigo, mejor de manga larga! Siento debilidad por las camisas blancas, y la tuya es preciosa! Coincido en lo de la manga, mejor larga! A blouse is the perfect staple! super look a koszula bardzo mi sie podoba! ...and u wear it greatly! Muy guapa. Adoro las camisas blancas.